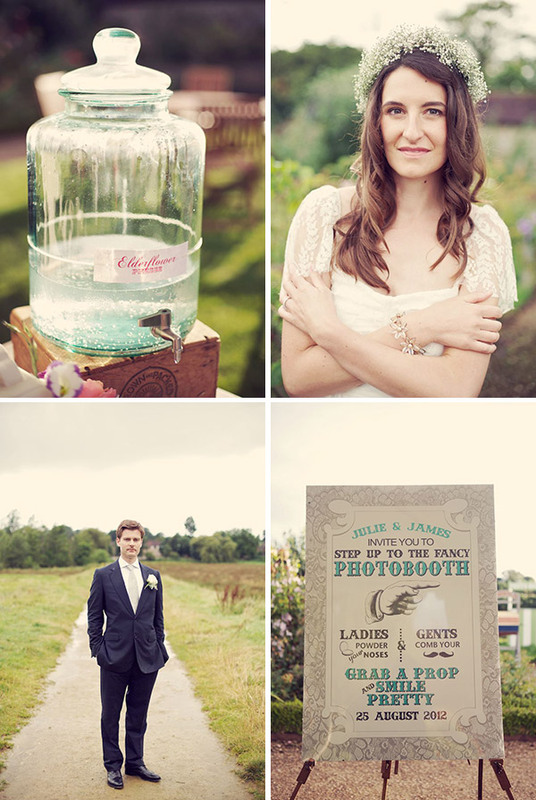 Julie and James had an epic wedding back in August. Bikes, humongous florals, massive balloons, erm… A cellist, caricaturist, accordionist – a magician and a Beatles tribute band. And trust me – that is not the full lot, not by a long shot! 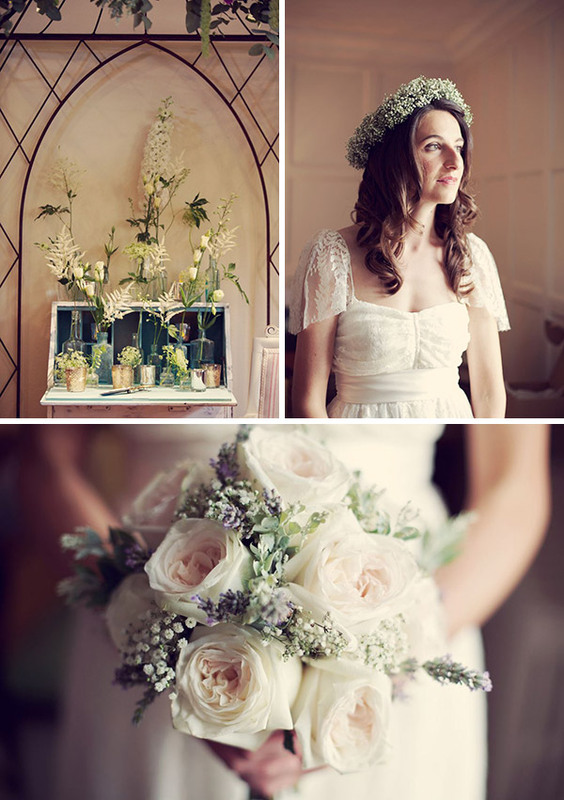 This vintage inspired summer garden wedding could so easily have been a wash out. It rained proper soak-you-to-the-skin rain pretty much all day but Julie and James just got on with it. Photography today is by Lisa Devlin. James and I got married… Twice! First at the Old Marylebone Town Hall in London, with only a handful of people (thirteen to be exact, our closest family and friends) – this was our civil ceremony of course. It was a lovely day, the ceremony was sweet and short and we celebrated with a drinks and canapés at the Ritz Hotel. Then we got married a second time two days later, at The Walled Garden at Cowdray in West Sussex, with over a hundred guests and an absolutely wonderful humanist ceremony – that was our ‘real wedding’ as we call it! The Walled Garden is a beautifully restored Tudor garden with two lovely function rooms, on the Cowdray estate, right next to the Cowdray Castle ruins. We were struggling a little to find a venue that was both beautiful and relaxed and when we visited The Walled Garden, we knew we had found the perfect place for the type of wedding we wanted. Despite the venue’s very strict regulations and the torrential rain, the day was everything we had hoped for. It was really a weekend-long celebration, with a welcome dinner on the Friday evening (the day before the wedding) at The Duke of Cumberland, the loveliest country pub you have ever seen with a view of the hills, which won the “Pub of the year good food guide award”. On Sunday (the day after the wedding) we had a ‘farewell brunch/afternoon tea’ at the super cool Haymarket Hotel in London to which guests where driven all the way from West Sussex in a big red wedding bus. The Haymarket Hotel is an amazing venue, the food was delicious and the events team super helpful. Because our wedding was really going to be three separate events, we made the decision early on to hire a wedding planner. We knew instantly we had found ‘the one’ when we met the very relaxed and super lovely Kate Fletcher, who has a passion for all things vintage! In fact she is a vintage stylist and runs Vintage Style Hire: if you are planning your wedding right now and looking for some vintage items to style your big day, I’m pretty sure Kate has whatever you’re looking for! Kate was really amazing! Our wedding and all the planning that went into it was virtually stress-free. So much work goes into planning the biggest party of your life and I think we could easily have lost our minds without her help! Hiring a wedding planner is of course a big investment as most charge 10% of your wedding budget, but there is no doubt in our mind that it was worth every penny. Of course you still get to make all the decisions, it is still your day and your vision of it. In fact, saying that I really got into the whole wedding styling and planning would be an understatement and I really enjoyed it all! Knowing that Kate had it all under control, both while planning and on the day was such a relief. On the day, we were able to be guests at our own wedding without needing to worry about a thing, and that was really worth a lot to us. Thank you so much Kate! For our Save The Dates, we did a bit of DIY: I asked my brother to take some pictures of us holding a blank piece of A4 paper and used fotoflexer (a free editing online software) to add the text. We got this printed at thepostcardcompany (who are one of the few companies doing square postcards). We also got a stamp made at englishstamp. On the back of each postcard, we glued a lovely small envelope and slipped a stamped piece of paper in it. One of the first things James and I did after getting engaged was look for stationery. I have a passion for stationery – beautiful paper and cards make my head spin. It’s a potent genetic condition, which I inherited from my mum and means I MUST buy every lovely card I see (I have themed boxes of cards at home, yes that’s how bad it is). Anyway, all this to say that I take stationery pretty seriously. I was looking for something beautiful and different… That’s when I found Katharine at Papermonkeys through a Google search. Katharine is an illustrator and does the loveliest personalised wedding stationery you have ever seen! Katharine illustrated every single one of our events – the pub welcome dinner, the wedding, the Beatles band, the Haymarket brunch. Our invitations really told the story of our wedding weekend. On the front of our invite, our beloved French Bulldog ‘Harvey The Frenchie’ is proudly peeking through the door of the Walled Garden, and on another drawing, our cat Oliver is snoozing on a vintage chair from Vintage Style Hire’s collection. My favourite part, however, is the illustration on which I am in a striped top complete with beret and a bike, a baguette under my arm and Bretzels in a basket (like I said, I am French and German! ), next to James in wellington boots, with a tweed jacket, a big mug of tea in one hand and an umbrella in the other (obviously thet perfect English gentleman!). Katharine also illustrated a Thank You card on which we are wearing the same outfits we wore the day James proposed. Every single guest commented on our invitations and I couldn’t keep count of how many said they were the nicest they had ever seen. We are going to have all this lovely artwork printed and framed and it will be such a wonderful keepsake of our wedding. I really can’t recommend Papermoneys enough! In addition, Berinmade made some GORGEOUS wedding day stationery: calligraphy on mix and match florals for our table numbers, menus but also various signs such as a ‘Here comes the bride’ sign, ‘Smile to the Groom’, ‘Bar now open’, ‘Keep warm’ (we had pashminas available for our guests), ‘Singing in the rain’ (we had also ordered 70 umbrellas from jollybrolly) and more. Her work is stunning. Katie Sue who is on notonthehighstreet did our table plan and name tags, which all looked gorgeous! I first tried on a wedding dress by ‘accident’, just for fun, as I walked by a bridal store with my best friend shortly after getting engaged. When they asked me when the wedding was, I said I knew it was soooo far away but just thought I’d pop in and I was amazed to hear that 6 months to a year before the wedding day is the right time frame to be looking for a dress if it is made to order! So brides to be, it’s never to soon to start looking! I knew I definitely didn’t want a big bridal dress. They can look beautiful and stunning but they’re just not ‘me’. I had a pretty clear idea of what I wanted: something ‘flowy’, simple but bridal, romantic, a little boho, not too white and most of all, lace. Lace, lace, lace, lace – I love it. When I tried my 70’s inspired wedding dress at The Vintage Wedding Dress Company (where everyone was super friendly and helpful), I instantly knew I had found the one… It was all the things I described above but, above all, I completely felt like myself in it. When I looked in the mirror, I saw me, not me dressed up as a bride. I loved the thick lace and beautiful pattern and to make things even more perfect, I found out the lace was French. It was meant to be! I wanted some short sleeves added and The Vintage Wedding Dress Company ordered some extra lace and Bridal Alterations in Clapham made the perfect sleeves. They are very talented and I can definitely recommend them. I also bought a 1940s piano shawl from The Vintage Wedding Dress Company to go with the dress, as well as the gorgeous 1950s pearl and glass bracelet I wore on the wedding day. I loved the fact that it was unique and had a story. I thought about wearing a veil, they are so beautiful, but it just didn’t feel right for some reason. I simply wore a beautiful gypsophilia flower crown which our amazing florist, Sam from Violets and Velvet, created. Here is a tip if you are planning on wearing a flower crown: ask your florist to wire it with small loops so it can be fixed to your hair. Sam did this and my crown didn’t move an inch all day or night! I loved the fact that the crown was so ‘pure’ and simple and I’m really glad I listened to the little voice telling me that the veil wasn’t right for our wedding. I found it quite difficult to find someone who could do both makeup and hair. I couldn’t find someone who could do a good blow dry for my hair type and I had two trials with two different people before meeting Antonia from Elle Au Naturel. She was really fantastic. Not only did she actually listen to what I wanted – a natural, ‘fresh faced’ look (I hardly wear any makeup in ‘real life’) for makeup and natural looking wavy hair – but she also knew how to do the perfect blow dry (which I don’t!!). Hair prep is everything, especially if you want to wear your hair down like I did… After the blow dry, she simply rollered it up to create a natural looking wave. With the help of her assistant, they also did our mums’ and bridesmaids’ hair and makeup and everyone looked gorgeous! On the wedding day, it started POURING DOWN with rain just as we were having our photos taken in the middle of a field without any umbrellas handy! Rain was literally dripping down my hair and, despite this, the waves held! Now if that’s not proof that Antonia is good, I don’t know what is!!! I have to be honest, I don’t know the first thing about flowers! Roses and peonies are about the only two kinds I can recognise so I was really lucky to meet Violets and Velvet. She created the flowers of my dreams from a few photos I had shown her! She literally created the most beautiful floral archway anyone had ever seen. I am told it was made of roses, peonies, hydrangeas, stocks, spray roses, amaranthus, dahlias, gypsophilia and garden foliage. All I know is that when I saw it I just couldn’t believe how gorgeous it was. Lucky us, we got to get married right under it! The beautiful bridal and bridesmaids bouquets were pale pink roses, gypsophilia and lavender. We had mason jars filled with a loose posy of flowers placed on the chairs along the aisle for the ceremony. Sam also created five stunning large stone urns to go on each window sill of the reception room, filled with peonies, hydrangea, buplerum, dahlia, spray roses, blooms, delphiniums, snapdragons stocks and garden foliage. We had two bikes at the venue used as props and she filled one of the bike’s basket with a stunning arrangement of flowers, similar to the ones used for the archway. Then there were all the bud vases everywhere at the venue, on various little tables and corners. These were filled with lisianthus, spray roses, roses, hydrangea in pale pinks and chalky whites. Sam’s flowers were all so beautiful that I am seriously considering learning to spell their names without googling them! James and I were worried that only having a ceremony at the town hall would feel rushed and lack in spirituality. We are both atheists and thus would not get married at church, but we still wanted our wedding ceremony to be beautiful, romantic, ethereal, spiritual and ritualistic. We feel it is the most important part of the day and really wanted it to be magical so, early on, we looked into humanist ceremonies. This means having a legally binding ceremony at the town hall and a symbolic ceremony with a humanist celebrant. In France, religious weddings are not legally binding and couples always must have a civil ceremony first, no matter what. So the idea of having two ceremonies seemed very normal to me and, while James thought it was little strange at first, he immediately liked the idea of having a humanist ceremony that would correspond to who we are. If any of you readers are considering doing this but feel a little worried that it might not feel ‘real’ to get married a ‘second time’, trust me when I tell you that it feels very real, intense and beautiful. It was our favourite part of the whole day. If you are not religious either, what will matter to you is making a public commitment in front of the people you love. We had originally planned on having the ceremony outside, in the beautiful garden. That was very important to me and so when it became clear that it was impossible because of the weather, I was super disappointed at first. But actually, I think we needed the rain and the ceremony to be taking place inside the Walled Garden’s beautiful courtyard room to create a more intimate atmosphere. Our wedding planner and stylist Kate styled the room in the most beautiful way imaginable (in fact the venue’s owner said it had never looked more beautiful), using a vintage desk from her Vintage Style Hire collection as a backdrop and a lot of beautiful candles. Sam, our florist, arranged some amazingly gorgeous flowers on the desk and her floral archway, which was just above, was simply literally breathtakingly beautiful. The room looked so gorgeous, thank you so much Kate and Sam. The acoustics in the room were great. In fact, we had two moments during the ceremony where we were just listening to our wonderful cellist Lizzy May play – it was incredibly beautiful. Our ceremony was a truly beautiful moment that brings tears to my eyes every time I think about it. We both laughed and cried (as did our guests), and we also reflected and took it all in. We are so grateful to our celebrant for having made it happen. It was magical. We will never ever forget it. Thank you Katie. Every single guest commented on the ceremony throughout the entire evening and the next day, and still to this day, it is the first thing people tell me when talking about the wedding. Several people said they had never seen such a genuine, romantic, beautiful and original ceremony. We owe it all to our beautiful true love and to our wonderful celebrant. For favours, we followed the beautiful tradition of giving each guest some sugar-coated almonds that symbolise eternal love and fertility, from French chocolatier Jeff de Bruges. They have a whole range of containers you can choose from as well as ribbon that is personalised. Of course, what we didn’t realise is that, in England, some say that the number of almonds you give each guest symbolises the number of children you are going to have… Had we known, we might not have included nine almonds in each favour!! But hey, the more the merrier! James wore a navy blue, fully hand-stitched made-to-measure suit from Cad & the Dandy on Saville Row. He looked stunning and it was so great that I was not the only one looking forward to wearing something really really special. He had several fitting appointments and the whole team at Cad & the Dandy were really great. His shirt was also made to measure there, and he wore an elegant silver grey tie and simple white rose and lavender buttonhole. He looked amazing!!! We had best men and bridesmaids, as well as witnesses (a French tradition). The men all wore their own navy blue suit and white shirt and James got them beautiful silver grey ties from Ralph Lauren as a present, as well as socks and vintage cufflinks which we found on markets in Brick Lane and Hampstead. The amazing Lisa Devlin photographed our wedding. Lisa is the friendliest person ever and, along with her second shooter Kat, they were really amazing to work with! We loved Lisa’s spontaneous, natural style and could not be more pleased with the photos. The day was a bit of a challenge really, as we were SUPER unlucky with the weather. It only rained two hours the whole day, and that was during our ‘garden party’ and photos! Lisa had just told us that ‘touch wood’ she’d never had to shoot in the pouring rain… Well there is always a first and our wedding was it! It rained SO MUCH it was crazy and we were stuck in the middle of a field. I think everyone was afraid I would burst into tears, but I couldn’t stop laughing, the situation was so unlucky and surreal! There we were with our bikes styled with ‘Just Married’ signs ready to take photos I really wanted, and within 5 minutes we were drenched! The best men ran back to the venue to get the matching umbrellas we had of course forgotten to take with us, everyone was soaking wet, the bridesmaids dresses were starting to get see through, my dress and ballerinas were full of mud… We’ll never forget that shoot! There is that one photo on which I’m laughing, one of my bridesmaids is looking at me hoping it’s a sincere laugh and not that of a mad bride loosing her mind and my other bridesmaid is looking at the camera clearly thinking ‘Oh my God!’ – I laugh every time I look at this photo as it summarises the situation so well! Lisa and Kat were amazing, working under the pouring rain and getting that shoot done no matter what! Just before dinner, the sun came out for a bit, creating a lovely ‘after rain’ evening light and some really beautiful ‘romantic’ photos. And then of course there are the amazing ‘rainbow’ photos! In short Lisa was amazing! We absolutely love our photos and it is wonderful to relive the day every time we look at them. Thank you so much Lisa! Natasha Stanbridge, our videographer from My Film, was equally amazing. Natasha was so laid back and cool, making us feel super relaxed. She is incredibly friendly and her and her second shooter Alex were fabulous. They also put up with the rain, Natasha had wrapped a pashmina around her camera and was shooting pretending not to be soaking wet! We are so glad we have an amazingly beautiful video of our wedding. I know some people hesitate about getting a videographer, feeling that photos are enough, but a video really brings something different and unique. It brings the memories back to life, literally. Natasha edited the video in ‘super8 style’ and we absolutely love every single minute of it. We chose the song ‘I’m a believer’ to go with the video because it is ‘our song’ (a few months after we started seeing each other, James recorded himself playing the guitar and singing this song ) Thank you so much Natasha! Enterainment is a big topic because we always said that our top priority was for our guests to have fun after the more ‘serious bit’, the ceremony… We were lucky enough to work with amazing people. During the garden party we also had George Williams, a caricaturist and the wonderful Mark Shortland, a magician whom guests could not stop talking about after seeing his amazing tricks! During dinner, Fifi the French accordionist from Oh La La music played and got all the guests to sing along in French no matter what their nationality. She was really great! During the party, we had an open bar and hired a mixologist to make cocktails and we had a tribute Beatles band, the Counterfeit Beatles. They were really fantastic! We had a hard time deciding what type of band to get for our party (we’re not into ‘modern music’ preferring vintage tunes) and kept saying ‘If we could have the Beatles…’ and then we realised that there were some really cool Beatles tribute bands out there. We saw the Counterfeit Beatles perform in London and they were amazing so when our wedding day came, we knew the party would be great. They had everyone dancing until the last minute. The French and German guests loved it as it was ‘so British’ and all the Brits were super excited to have ‘the Beatles’ live for the first time. It was brilliant. Our first dance had, of course, to be a Beatles song. We chose ‘Do you want to know a secret’, just because we love it! We took some dancing lessons as we are both terrible and thanks to Doug at the First Dance Company, we had a lot of fun practising and managed not to freeze when all eyes turned to us on the evening of the big day! Last but not least, the day after the wedding, for our ‘farewell brunch’, vintage vocalist Simon Partridge sang wonderful tunes at the Haymarket Hotel. He was so elegant and just perfect for this urban, stylish venue. We love the ‘vintage style’. It isn’t just something we did for our wedding, our flat is decorated this way (especially when it’s tidy!!) and so there was no doubt about the feel we were hoping to achieve on our day. Now of course, one problem is having all the elements necessary to create, for example, an outdoor seating area and all the bits and bobs that bring the whole style together. 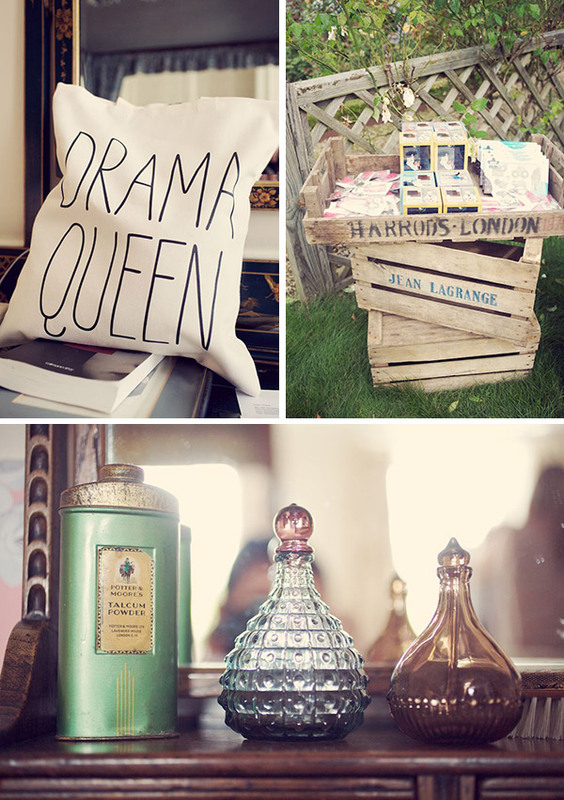 It would be a ridiculous investment to buy all these things so we were super happy when we found out about Vintage Style Hire who, as the name indicates, hire out vintage styling props – from perfume bottles and crates to sofas and bikes. Their collection is quite extensive and the best part is that Kate, the owner, is just so passionate about what she does that she is bound to inspire you! I think the most important piece of advice would be: be really meticulous and organised when you plan the wedding but a few days before the wedding, just LET GO. Never mind if you dress gets dirty or if it pours down with rain, it won’t matter, you are marrying the love of your life. It is truly the best feeling in the world to know you are married. To be honest, I thought it wouldn’t change much as James and I have been living together for so long, nor had been dreaming of the day I would get married since I was a little girl, but to my amazement, it does make a huge difference! It just feels amazing to look at your partner and see your husband or wife. Knowing that you both have committed to love and support each other for the rest of your lives, with all your heart, in front of all the people you love is the most wonderful feeling in the world. And your wedding day will be the best day of your lives….so far! Rain certainly did NOT stop play… And in this country it’s a philosophy that is probably wise to adhere to. I want to get married in a walled garden!! 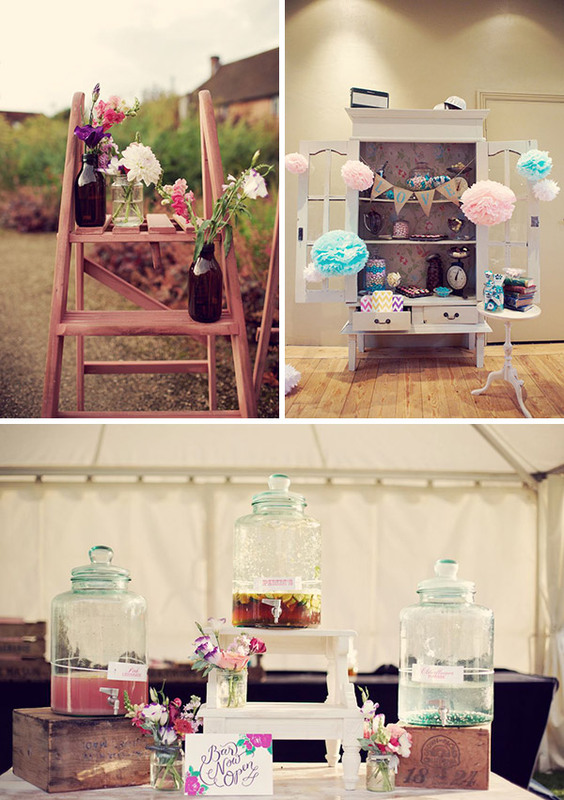 This wedding is absolutely gorgeous, so many lovely details to steal…I mean borrow ;)! The stationery is gorgeous and does anyone know where those lovely brollies are from…just in case! What a lovely wedding! I particularly love the photos in the rain, they’ve come out beautifully. It makes SUCH A DIFFERENCE if the bride can smile through the rain, everyone can then relax and enjoy it too. I love the bikes, great idea. I have not yet seen a posh chair in the middle of a pathway with giant balloons hanging from the back before…but I like it very much indeed. As well as pretty much everything else….even the rain. @Philippa if it’s one thing I learnt, it’s that you can’t control the weather. I clearly stated to anyone that would listen that I didn’t want the sun to shine on my wedding day. What did I end up with? A day of blazing sunshine sandwiched between days of torrential rain. Once I accepted the fact I couldn’t change the weather everything was ok. I am in LOVE with this wedding..seriously it’s one of my favourites. I feel like I’m in the 21st Century’s interpretation of The Secret Garden. The balloons, the ribbons, the floral headpieces, the chairs and THOSE BIKES! Well done on not letting the rain spoil your big day, it is all too easy to get upset by the little things when you’ve been planning for so long. Thank you all for your lovely comments!!! We are so happy you like the wedding so much! @Lauren, I think I might give that reverse-weather-psych stuff a go! I love the stationery, the furniture, the umbrellas, so many lovely details! And I am happy to see a bride in flat shoes, I got married in sandals too! It was a rainy day so the couple will be rich as so the tradition says…I love the details of this wedding, the fun idea of the “just married” bikes and not a car..congrats! It was such a pleasure to sing for Julie and James at their Haymarket Hotel brunch. I had no idea what had gone on the day before and having read this I can’t help but wish that I’d been there as well! Fabulously stylish and beautifully captured.